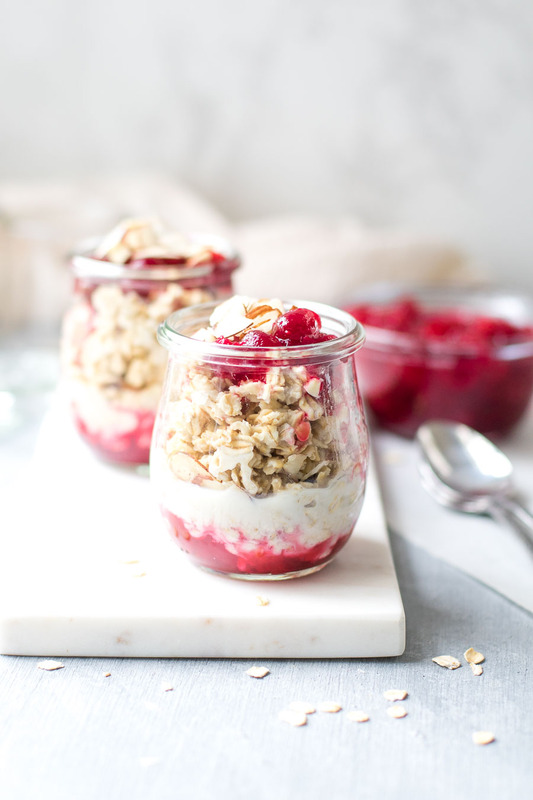 Use up leftover cranberry sauce with these easy overnight oats. Plus, get new ideas for using up extra cranberry sauce. I hope your Thanksgiving was great. I enjoyed the time off and making some of my favorite dishes in the kitchen. Though I grew up on canned cranberry sauce, I’ve been making fresh, homemade cranberry sauce for the past couple years and probably won’t go back to the other stuff. At least not unless I’m in SC with the rest of my family. In any case, we always end up with extra cranberry sauce! 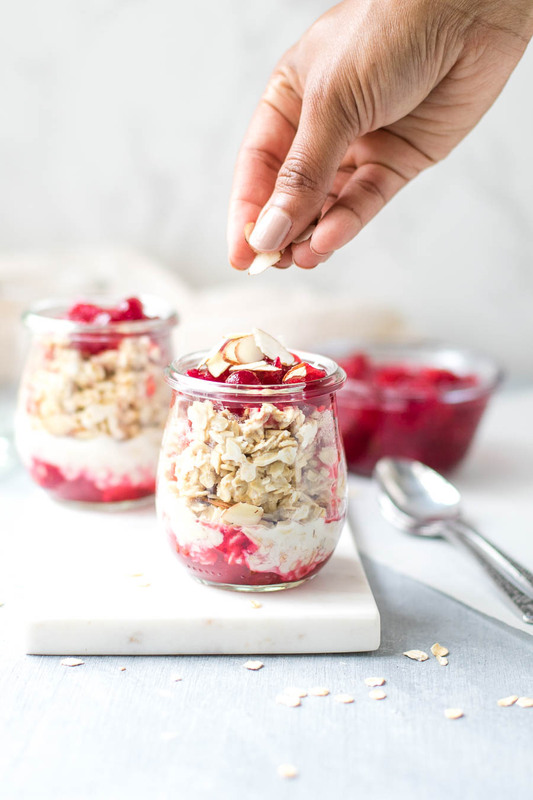 For this recipe, you only need a few ingredients: leftover cranberry sauce, equal parts oats and milk, and nuts or seeds. Oh and jars. Aren’t they the cutest? 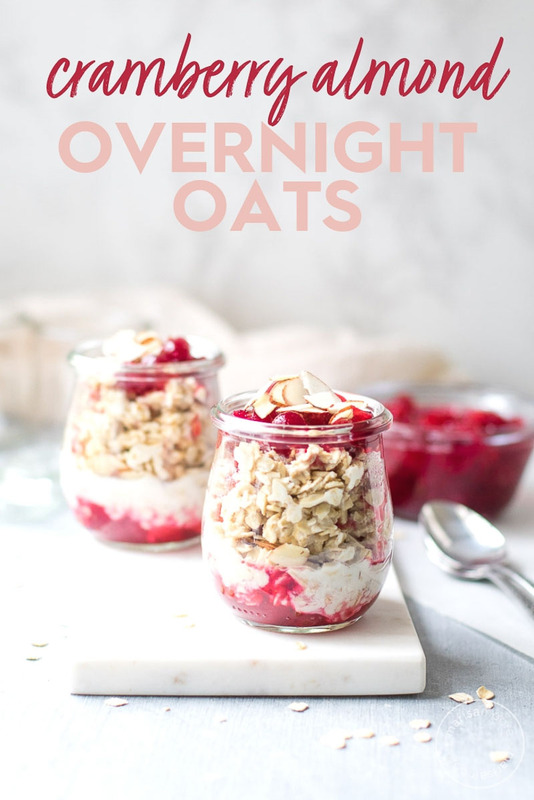 To build the overnight oats, layer a couple tablespoons cranberry sauce, then add the oats and milk. Finish with another tablespoon of sauce and sprinkle on lots of almonds or pumpkin seeds. You can also add cinnamon to the oats for more flavor. For a boost of protein, use dairy milk or pea protein milk to keep it vegan. Swirl it into warm, cooked oatmeal with a sprinkle of walnuts. Add it to a Greek yogurt bowl with granola or pumpkin seeds. Use it instead of jelly on a peanut butter sandwich. Add a couple tablespoons, vodka, and ice to a shaker for a cranberry cocktail. Make an easy cranberry tart. Add a bit of cornstarch, tapioca flour, or arrowroot powder to cranberry sauce to help it thicken. Add to pie dough or puff pastry and bake for an easy dessert. Add some to a muffin or quick bread batter. Freeze it. If you won’t be using it all up in a few days, freeze the cranberry sauce in a freezer jar or freezer bag. You can thaw and use it for future meals. This list could go on. How do you use up your extra cranberry sauce? I’d love to hear it in the comments! 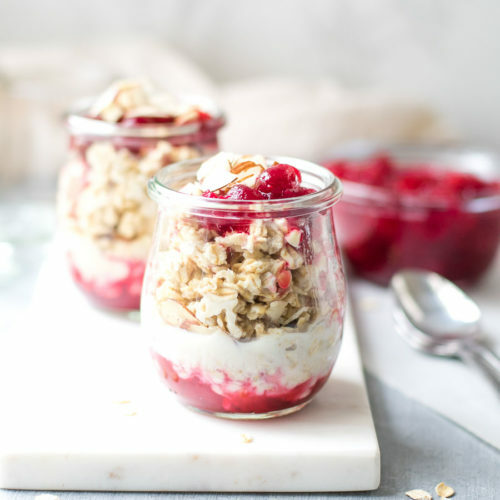 Use up leftover cranberry sauce in overnight oats! Send your holiday guests home with breakfast made simply, using dairy or non-dairy milk, and nuts or seeds. Add 2 Tbsp cranberry sauce to a jar. Add the oats and milk. Top with more cranberry sauce and sliced almonds. Close the jar and refrigerate overnight. Top with more milk in the morning if desired. What a great way to use the cranberry sauce! This is brilliant. 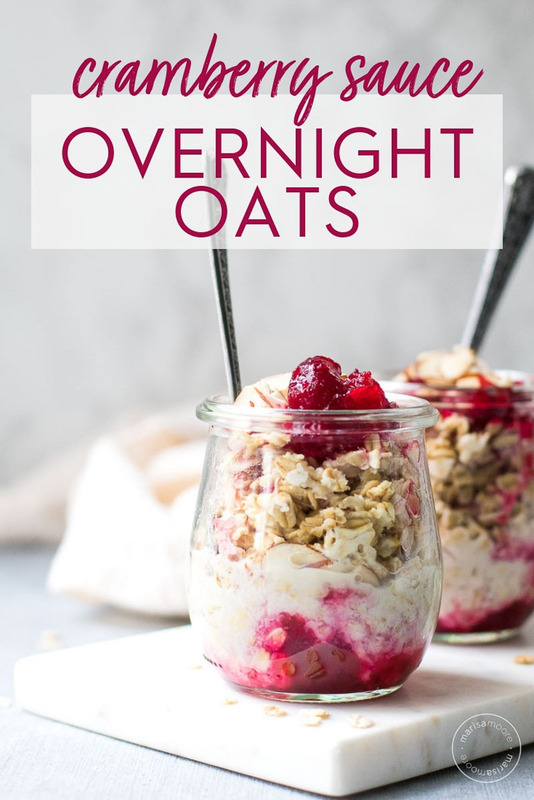 Cranberries and oats are such a tasty combination. 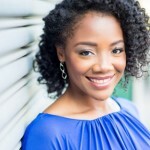 You are one smart person! This is such a good recipe and so simple. Thanks so much for the recipe. What a good way to use up some cranberry sauce. Although to be honest, we rarely have any left but if we do!